"Very good start," Trump said in response to reporters as the leaders were joined by senior officials for further discussions. Presidents Donald Trump and Vladimir Putin held a historic summit on Monday vowing their determination to forge a reset of troubled relations between the world's greatest nuclear powers. Trump, bent on forging a personal bond with the Kremlin chief despite allegations of Russian meddling in US politics, went into the summit blaming the "stupidity" of his predecessors for plunging ties to their present low. "I think it's a good start: very, very good start for everybody," the US leader told reporters after meeting Putin for more than two hours with just their interpreters present, and just before they were joined by their national security teams. 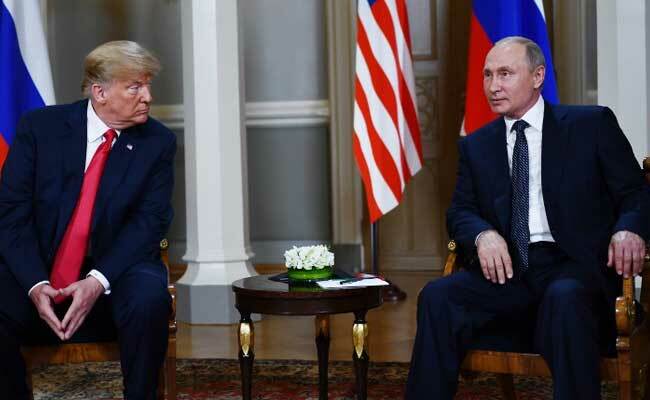 Many in Washington were agog at Trump's decision to sit one-on-one with Putin, a former KGB spymaster, worried about what he might bargain away after previously cosying up to the autocratic leaders of China and North Korea. Indeed, some domestic critics wanted the Helsinki summit called off entirely after 12 Russian military agents were indicted under a long-running probe into Moscow's alleged manipulation of the 2016 US elections. But Trump, convinced his unique brand of diplomacy can make inroads with Putin, pressed ahead and looked forward to "having an extraordinary relationship" as the pair sat down to discuss everything from Syria, Ukraine and China to trade tariffs and the size of their nuclear arsenals. Putin, basking in congratulations from Trump and other world leaders for the successful staging of the World Cup in Russia, said: "The time has come to talk in a substantive way about our relations and problem areas of the world." Trump added: "Frankly, we have not been getting along for the last number of years. And I really think the world wants to see us get along. We are the two great nuclear powers." Shortly before the summit opened, Trump was asked if he would press Putin over Russia's alleged manipulation of the election that brought the mercurial property tycoon to power 18 months ago. He said only: "We'll do just fine." But there are many points of friction that could yet spoil Trump's hoped-for friendship with his wily opposite number, who has run Russia for 18 years. Russia's foreign ministry tweeted in response: "We agree." Trump's US opponents tried, in turn, to gain traction for the sarcastic hashtag lampooning his reluctance to criticise the Kremlin: #BAF (Blame America First). But over breakfast with Finland's President Sauli Niinisto, he insisted NATO "has never been stronger" and "never been more together" thanks to his insistence on all allies paying their fair share. Turning the tables, European Union President Donald Tusk said Trump was guilty of "spreading fake news" with his remark about foes, and warned that the trade tensions could spiral into violent "conflict and chaos". "Europe and China, America and Russia, today in Beijing and in Helsinki, are jointly responsible for improving the world order, not for destroying it," he tweeted. "I hope this message reaches Helsinki." Protesters have been on the streets of Helsinki to denounce the policies of both Trump and Putin. Greenpeace draped a giant banner down a church tower urging: "Warm our hearts not our planet." Trump has refused to personally commit to the US refusal to recognise Russia's annexation of Crimea, leaving open the possibility of a climbdown linked to a promise by Putin to somehow rein in Iranian influence in Syria.